Don't let it prevent you from trying Kirby Triple Deluxe, however. The game has a lot to offer, and with all the secrets and extra content it keeps you entertained for quite some time. If you're a fan of Kirby games, Triple Deluxe won't dissappoint. In fact, it may be the best and most complete Kirby game to date. Oh Kirby, you lovable little pink marshmallow dude. Or whatever you are. You tread amongst the greats, achieved fame and recognition and yet you are still one of the unsung heroes of Nintendo. Everyone knows you, but you haven’t quite reached the same status as Mario, Link, Samus, Yoshi, Donkey Kong… But does that mean you need to stand in their shadow forever? Perhaps it is time to change all that. Perhaps Kirby Triple Deluxe will allow you your time in the spotlight. For what it’s worth, and right off the bat: Kirby Triple Deluxe, for all intents and purposes, is probably the among the better 2-D platform games on 3DS. And that’s saying quite a lot, seeing how the system doesn’t exactly suffer from a shortage of games in this particular genre. It is also quite possibly the best Kirby game to date. There are multiple reasons why this is the case. Let’s start with the presentation. Every game benefits from a great sound track. If you’re looking for one in this game, you’re probably not going to find it. There’s a few memorable tracks, and it’s nice to hear many familiar tunes, but the variation is a bit lacklustre and it all becomes quite forgettable all to soon. Nothing distracting, but far from exceptional. A totally different case are the visuals. 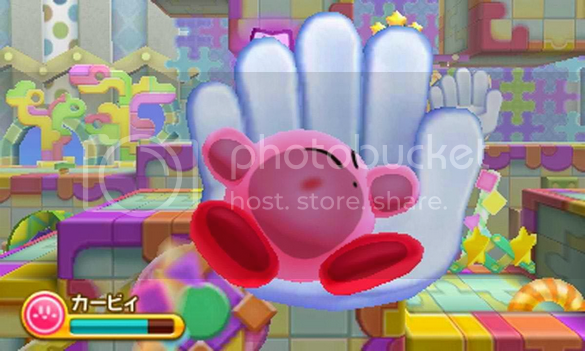 Kirby was always a game series featuring a happy and colorful world, and that hasn’t changed. 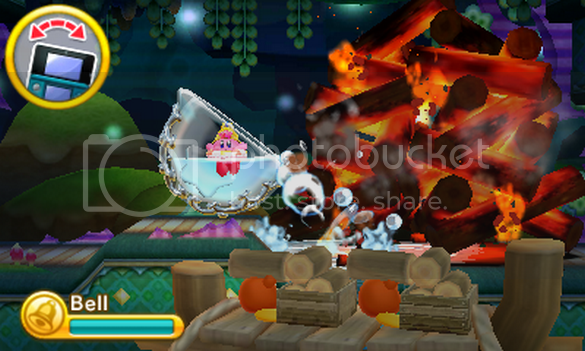 The 3DS manages to capture the spirit of this colorful, somewhat cartoony world perfectly, even in 3D. 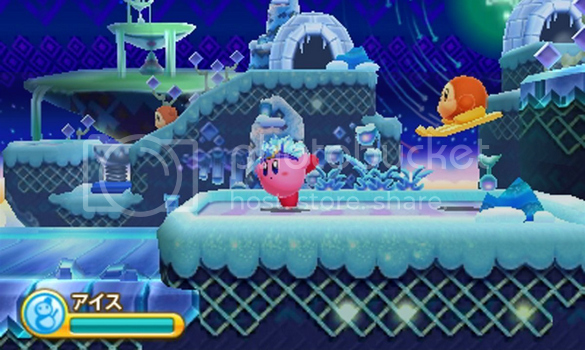 The world of Dream Land was always perfectly captured in 2D sprites, but a switch to 3D certainly doesn’t need to hurt the visual design at all, and Kirby Triple Deluxe more than proves this fact once more. It’s always commendable when 3DS games are worth being played in 3D as sadly this isn’t always a given. Kirby Triple Deluxe certainly benefits from turning the 3D slider of your 3DS up all the way, and part of that has to do with a gameplay element new to the series. 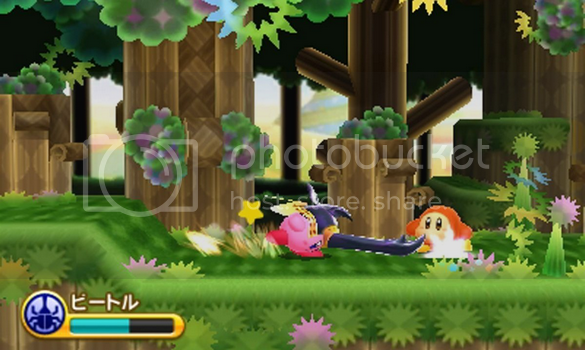 Frequently during your romp through Floralia you’ll come across the familiar Warp Stars from the earlier Kirby games, but this time around they come in a new variety, one that let’s you move from the foreground into the background, or vice versa. It’s obvious this feature was implemented to showcase the system’s 3D abilities, and it’s a nice touch. While initially little more than a fun visual gimmick with little actual gameplay implementation, you soon find yourself faced with sections where fore- and background interaction is actually an integral part in either progressing through the stage or finding certain secrets. One of the more memorable and fun examples of this is during the awesomely designed Ghost House levels, where the background is plastered with mirrors and certain obstacles are only visible on these mirrors, but actually exist in the foreground. This means you have to check the background in order to find out whether your taking a safe route, lest you bump into invisible nasties, like enemies, spike pits or walls. The reverse also happens, where things seem to exist within the foreground, but the checking the background reveals that they’re not actually there. There’s a ton of other fun ways this interaction comes into play, but it’s best to experience these for yourself. Of course there’s also sections in the game that make use of gyro controls. This implementation always seems a bit forced, and it’s no different here. Like Yoshi’s New Island before it, the game could really do without this rather unneccesary inclusion, but at least it works and it doesn’t feature prominently enough to really be a nuisance. 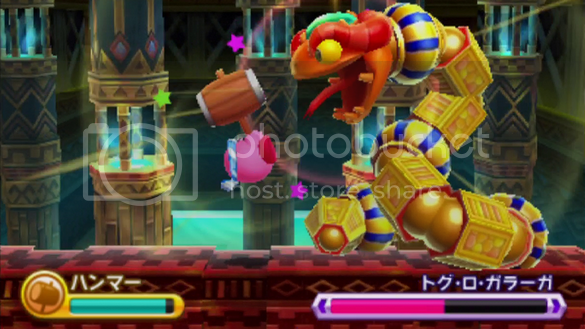 Aside from this new feature, Kirby Triple Deluxe also features a slew of returning gameplay elements, of course most notably the special powers Kirby can absorb from swallowing enemies. The variety of different powers is immense this time around, and almost any enemy you come across will grant you a power up. Every familiar powerup makes a triumphant return, and then there’s even a few new ones, like the Archer power where Kirby dons a Robin Hoodesque hat and bow and turns into a arrow-flinging marksman. It’s a great powerup to have, overall very useful, and there’s even some puzzles revolving around. A personal favourite is the Beetle Powerup, where Kirby essentially transforms into Heracross (from Pokémon, you know) and creates shishkebabs all day by impaling multiple enemies at once. Another highlight in this game: the Boss battles. These are simply so much fun to do. 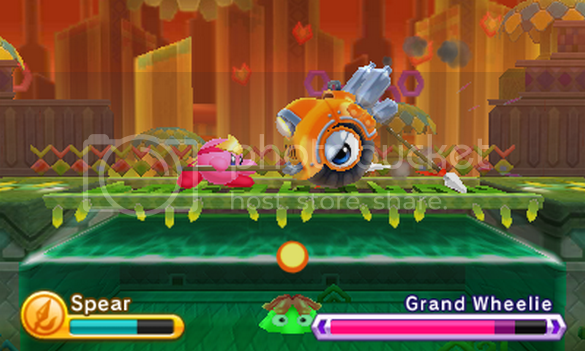 Whereas many platformers get away with relatively simple bosses with repetitive patterns, Kirby Triple Deluxe pits you against bosses that are all completely different from one another and have a great variation of different attacks. This keeps every battle fresh, not just from the other ones, but even during the battle itself. The fact that there’s the option of beating just the bosses in a special mini-game upon game completion is therefore truly welcomed. Also welcome are the secrets. There’s plenty of them to find in Triple Deluxe, and any platform game highly benefits from hidden collectibles. There are keychains to collect, for one, and there’s a ton of them. Whenever you come across one, you never collect a specific one, but are rewarded with a random one after completing the level. That means returning to a completed level and picking up all the keychains again may in fact net you some new ones, but there also always the possibility that you’re rewarded with chains you already have. There’s no real purpose to these, other than to collect them and be filled with nostalgia through all the awesome references to older Kirby games that represented with these keychains. The Sun Stones are a different story. There’s two to five of these in each level, and you need to collect a certain amount to be able to challenge the final Boss of a given world. Some aren’t hidden all that well, and this allows players of any skill level to reach and beat the boss without much trouble. Collecting all the Sun Stones requires some more searching and exploring, and rewards you with a bonus stage when you find all of them. Finding all the stones still isn’t particularly hard, and that also brings us to possibly the game’s biggest flaw: it’s all a tad easy. At no point will a seasoned gamer struggle to beat a level or section, and perhaps Kirby Triple Deluxe has purposefully been made this way to appeal to a large audience. It’s all very colorful and happy, and probably supposed to be kid friendly. And it is: anyone can ultimately beat this game. For more experienced gamers looking for a challenge: you won’t find it here. But then again, you never found that playing Kirby games, so there’s no real news here. Granted, there’s some additional modes that are unlocked after you beat the game, and these do present a greater challenge, but even then it won’t really test your skills or patience. Don’t let it prevent you from trying Kirby Triple Deluxe, however. The game has a lot to offer, and with all the secrets and extra content it keeps you entertained for quite some time. If you’re a fan of Kirby games, Triple Deluxe won’t dissappoint. In fact, it may be the best and most complete Kirby game to date. If you’re looking for a great platformer to play on 3DS, you’d do no wrong getting yourself this game, even if you could choose just one.